We don't just shoot your event we create an experience to enjoy and remember. Our equipment is mobile and is available anywhere and anytime. Branding or data retrieval; use digital photography as a way to attract guest to your booth, tent, trailer, space or store. Whether one event or a multi-cities running simultaneously mobile marketing through digital photography works. Everyone likes pictures but fun interacting photos people love. Free photos at an event creates lines and points of interest resulting in great marketing. Photography in Motion handles events on all scales. Photography in Motion has done multi-city tours for Kia, Mazda, Toyota, Verizon, American Express, and many more. 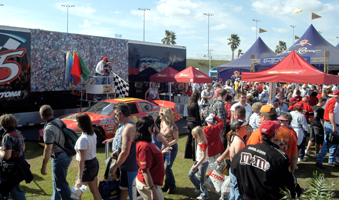 PIM has worked multi-city tours closely with some clients for over 8 years providing our services at Indy and NASCAR races nationwide. Retail Grand Openings to Sponsorship let photo activation bring the guest to you. We take photo activation to another level. Whether your guest is climbing into a Nascar for a photo or we using Green Screen Technology to super-impose your guest rock climbing; your guest and the guest watching will have a blast. Digital Photo is great for meet and greets. People love photos with celebrities. Our onsite photo is great way your guest can take their meet and greet memories home. Green Screen is also a great option at meet and greets. If your celebrity is too busy to take the photos we could use Green Screen Technology and put your guest with the celebrity without the celebrity present. No more 4 foot cardboard cut outs! Jeff Gordon cannot make it; Green Screen him!